There were Hertfordshire medals for Spartans GRANT RAMSAY (16:37); SIMON JACKSON (16:41); STEFFAN FORD (17:46) and RICHARD SPRINGALL in a new personal best of 17 minutes 51 seconds at the County 5K road championships in Hatfield on Wednesday where they won BRONZE in the team competition for seniors (i.e. aged 18 plus). They did even better in the open team competition where teams consisted of five runners. With DAVID RIDDELL running a new personal best of 18 minutes 7 seconds they were second. Strength in depth. Also in the open event Grant was second veteran (40 plus); Simon third veteran (40 plus); and David third 50 plus. BRIAN WHITE was first veteran (60 plus) in 18:56 and BARRY OSBORNE fourth 60 plus in 20:07. MARK COLLINS reduced his PB to 19:07; MICHAEL ANDREWS his to 22:52 and CAROLE SHELDRICK took a 40 second chunk out of hers when she finished in 25:08. JOHN HARRIS came in with a sub twenty 19:17; KIERAN FEETHAM with 20:37; JIM BROWN edged closer to 24 minutes with 24:02; ANDREA WESTCOTT had a good run with 26:03; SHARON CROWLEY ran a season’s best 27:00; PENNY SCHENKEL made a careful return from injury with 27:33 and PAUL HOLGATE came in with his daughter in 30:11. There were 188 finishers. The county championships for veterans are included in the race on Wednesday 13th September. HALEY McLOUGHLIN was running her first half marathon. She said the sun was shining as she made her my way around 13.1 miles of lovely countryside and that it was a flat route, well marshalled and with plenty of water stations. Haley struggled at mile 11 but remembered the advice Spartan coach Dave Stephenson gave her and was absolutely delighted with her 2 hour 24 minutes 6 seconds, and said she wore her Spartans shirt with pride and thanked the Fairland Valley Spartans starter group for giving her the confidence to get out of her comfort zone. EMMA POULTER was also running her first half and came in with 2:54:32. ERICA GRAYSON was very pleased with herself. She took 6 minutes 56 seconds off her PB to finish in 2 hours 1 minute 15 seconds. This was a fast and flat course with a little congestion as it was on loops. After his success at Clacton JIM BROWN was playing with the fast boys at the British Masters Half Marathon National Championships in Northampton. The event attracted many of the fastest older runners in the country and was a real reality check for many younger runners. For example the women over 70 category was won in 1:40:44. Jim was fifth in his age group. On the undulating course he was 233rd overall out of the 671 finishers in 1 hour 48 minutes 4 seconds, 1 minute 27 seconds faster than on 20th August. 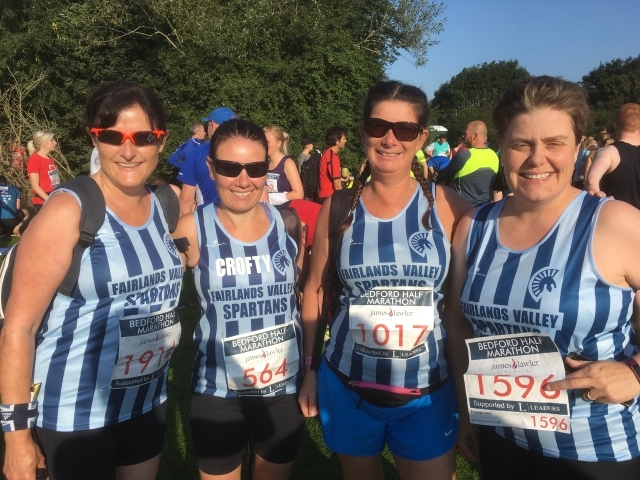 Three Spartans took part in the annual St Albans stampede on Saturday. The 12 hour event is hosted by St Albans striders and takes place on an undulating four mile fully off road loop in Sandridge. Runners can go solo or in relay teams of up to eight and are free to stop between loops at any time. The weather was perfect and the course dry. On arrival runners are met with free bacon rolls and coffee and the excellent buffet continued all day, concluding with pizza and beer at the end of the 12 hours at 9 pm. JACKIE DOWNES completed an amazing 12 loops ( 48 miles) and narrowly missed out on being in the top three solo female runners. KARTIK SHARMA, who has never run further than a half marathon before did four laps (16 miles) and in doing so learned some valuable lessons about fuelling and pacing. JOHN NELMS completed seven laps (28 miles) to complete another marathon distance before having to leave for work. The highest placed Spartan finisher at a parkrun this weekend was TIM SABAN who was first across the line at Canons Park in a time of 20mins 21 secs, a new course personal best (PB), while the fastest Spartan of the weekend was DAVID RIDDELL who just dipped under the 20 minute mark, finishing fourth in 19:58 at Westmill. Other Spartans who ran at “away” events this weekend were NICOLA KENNEDY (third woman in 24:45) and RICHARD KENNEDY (29th man in 25:31) at Sheringham, THOMAS SAUKA (24:22) at Keswick, TIM ROBINSON (24:09) at Panshanger and finally DANIEL SUTTON (23:51, new course PB) and VERITY FISHER (31:50) who both finished 23rd in their respective events at Rushmere. At Stevenage, RUTH REILLY was second woman to finish in 22:29 and achieved a new course PB. MONICA SMITHSON was 16th in 28:16, also a new course PB, and LAUREN HARNETT was 17th in 28:24. SALLY PHILLIPS also notched a top 50 finish by completing in 30:51. For the men MARK BEASLEY was 34th in 22:30. There were new course PBs for both RYAN DUNNING (38th in 22:54) and LEE PICKERSGILL (48th in 24:09). DAVID SCOTT (25:15), BARRY OSBORNE (25:28), PAUL HOLGATE (27:09, new course PB), JAMES SOUTH (28:09), JOHN WALSH (28:38), TREVOR BROOM (32:58, new course PB) and IAN ALEXANDER (tail-walking in 51:23) were also in action. Herts Veteran 5K Championships at Hatfield on Wednesday evening 13th September. FVS Handicap 5K in Stevenage on Thursday evening 21st September.